03/10/08–El Inmigrante will be screening at the Ybor Festival of the Moving Image in Tampa FL. Festival dates are April 16-20, 2008. This festival seems to have some really interesting films, scope it out if you are in the area. 07/17/07–Our DVD is now available!! 07/16/07–El Inmigrante will be screening at the CineSol Film Festival in South Texas. Our Texas festival premier! 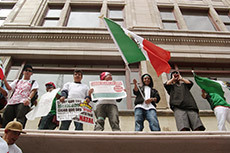 05/29/07–El Inmigrante will be playing a theatrical run at the Hollywood Theater in Portland, Oregon in June 2007. See Screening page for updated info. 05/29/07-Work on our DVD plugs along, we are almost finished. The revised release date is July 17, 2007. Stay tuned for more details. 04/18/07-El Inmigrante has won second place at the Muestra Internacional De Video Vision Frontera in Baja California, Mexico. 02/19/07–El Inmigrante has won THE NORTHERN RIVERS SPAA CHAPTER BEST DOCUMENTARY AWARD at the Byron Bay Film Festival in Australia. This is our first International award. Thanks so much to all down under! We only wish we could have been there with you all. 01/24/07–El Inmigrante has signed a United States and Canada distribution deal with Indican Pictures. We are of course very excited and honored. Our DVD release appears to be penciled in for June 12, 2007. More Details will follow. 01/16/07–Our Australian Premier! El Inmigrante will screen at the Byron Bay Film Festival in February. 10/16/06–El Inmigrante has beena accepted to the Festival Docusur in the Canary Isalnds. It will also screen at the Puerta Vallarta Film Festival. It has also been accepted to the festival in Benidorm-Alicantel in Spain. 06/10/06–El Inmigrante has confirmed more screenings. In October it will screen for the Impact Arts Festival in New York. It will also screen in New York in November as part of the Margaret Mead Film Festival. Also in October it will screen as a special selection in the Morelia International Film Festival as part of the Cine Sin Fronteras program. 08/20/06–El Inmigrante just received a nice write up in Variety!! 08/12/06–Courtesy of the American Consulate in Monterrey, Mexico and the Monterrey International Film Festival, John Sheedy, David Eckenrode, and John Eckenrode will be attending the Monterrey Film Festival this week. While there we will also screen El Inmigrante at the Tec de Monterrey Saltillo Campus. 06/29/06–El Inmigrante has been accepted to the Monterrey International Film Festival in Monterrey, Mexico. August 12-19, 2006. See screenings page for more information. 05/21/06–El Inmigrante has been accepted to the New York International Latino Film Festival held July 25–30. See screenings page for more information. 05/05/06–El Inmigrante has won the GRAND JURY PRIZE for BEST FEATURE FILM at the Indianapolis International Film Festival. Thanks a million to the whole crew at Indianapolis for this honor!! 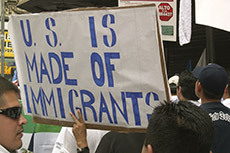 04/24/06–KVOA News Channel Four in Tucson aired a short story on El Inmigrante. It features a brief interview with John Sheedy. You can read the article and watch the streaming video here. Monday–Midnight, 9am, 1pm, 8pm, and 11pm. Tuesday–1am. 4am, 11am, and 6pm. 04/12/06–We just received a great write up at the GreenCine Daily. Upon reaching the site, scroll down to Portland Dispatch 2. 04/02/06–El Inmigrante has won the BEST DOCUMENTARY DIRECTORS AWARD at the Silver Lake Film Festival. Thanks a million to everybody at Silver Lake!!! 03/27/06–On the front of Immigration reform things seem to be happening minutely. 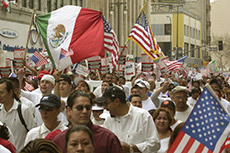 John Eckenrode took part in the big, 500,000 people, rally in dowtown Los Angeles. Some photos of that event are pictured left . The rally was very spirited but totally peaceful. On the federal front the senate just revised a new immigration bill and in April the Minuteman Project is gearing up to "patrol" the border en masse. So stay tuned to the national news. 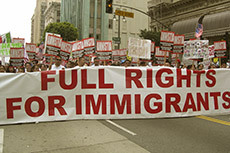 The following are some links to migrants rights activists and news sources to help stay up to date. Feel free to email johneck@elinmigrantemovie.com with any link suggestions. Vigilante Watch–Check for regular blog updates by border activist Ray Ybarra. Here is a link to the Minuteman Project. We do not condone the actions of the Minutemen, but provide the link so you can be informed of the issues from all sides. 03/29/06–El Inmigrante has been accepted to the Atlanta International Documentary Film Festival. See screenings page for more information. 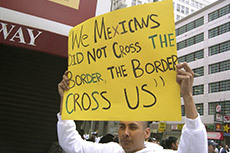 03/26/2006–El Inmigrante has won the JURY AWARD for BEST DOCUMENTARY at the Omaha Film Festival. THANK YOU Omaha! 03/26/06–El Inmigrante has been accepted to the Festival Internacional del Cine Pobre in Cuba. This will be our first screening off the shores of North America. 03/22/06–John Sheedy and Rick Carlson report that the screening at the San Diego Latino Film Festival was very well attended and very spirited. Both John and Rick where very happy indeed. On March 23 John Eckenrode is heading off to the Silver Lake Film Festival in Los Angeles and David Eckenrode is heading off to the Omaha Film Festival so stop by and see us. 03/15/06–El Inmigrante has been accepted to the Indianapolis International Film Festival. See screenings page for more information. 03/12/06–El Inmigrante has been accepted to the Santa Cruz Film Festival. See screenings page for more information. 03/07/06–El Inmigrante has won two new awards!! We won the JURY AWARD for BEST DOCUMENTARY at the Lake County Film Festival. We also won the AUDIENCE AWARD for BEST DOCUMENTARY at the Durango Independent Film Festival. We would like to extend a very hearty THANK YOU to everbody at both festivals for these honors. 03/02/06–I, John Eckenrode your webmaster, am heading off to Cinequest so there will be no web updates until 03/07/06. David Eckenrode and John Sheedy just called me from Durango Film Festival and it sounds like the opening screening went very well. Sold Out! 03/01/06–El Inmigrante has been accepted to the 44th Ann Arbor Film Festival. This is one of the oldest film festivals there is! See screenings page for more information. Also we will be screening in 11 more cities as part of the Full Frame/Emerging Pictures syndicated film festival. I will post more information when I get back from Cinequest. 02/27/06–El Inmigrante has been accepted to the Silver Lake Film Festival in Los Angeles. See screenings page for more information. 02/23/06–Lots of news, I will split it into two parts. El Inmigrante has been accepted to the Longbaugh Film Festival in Portland, Oregon. I, that being John Eckenrode, am very excited as this is in my home town! We have also been accepted to the Mid–Ulster Film Festival in Northern Ireland, this will be our European Premier. They are currently rebuilding their website so more info will follow shortly. El Inmigrante will also be screening at two upcoming non–festival events. 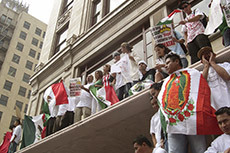 First it will show as part of a multidiscipllnary congress is Mexico City addressing immigration issues. 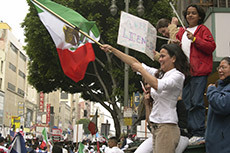 The four day event entitled, El Primer Congreso Multidisciplinario sobre Inmigracion Mexico–Estados Unindos: Los multimedios en las zonas fronterizas, will take place February 26–28, 2006. It is presented by La Filmoteca of the National Museum of Popular Culture, the United States Embassy and many others. El Inmigrante will screen Feb. 27 at 1:20 PM at the Filmoteca. Our only regret is that we will not be able to make it to Mexico, DF, this looks like an outstanding congress. We will also be screening May 6th at the Fountain Theatre in Mesilla, New Mexico as part of a day of border related films to coincide with Cinco de Mayo. The event is being put on by Jeff Berg who David and I met at the Sante Fe Film Festival. Updates on the specifics of this event will follow shortly. 02/21/06–Sweet 16. El Inmigrante has been accepted to the Independent Film Festival of Boston. See screenings page for more information. 02/13/06–BIG DAY. El Inmigrante has been accepted to the Full Frame Documentary Film Festival and the Arizona International Film Festival. See screenings page for more information. 02/06/06–El Inmigrante has been accepted to the Wisconsin Film Festival. See screenings page for more information. COPYRIGHT 2005. 6512 PRODUCTIONS / OUZEL MOTION PICTURES / IMPALA ROJA. ALL RIGHTS RESERVED.